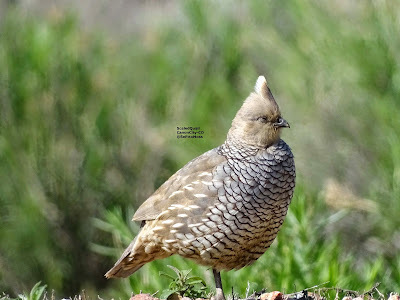 A friend of mine here in Canon City lives in an area with a lot of Scaled Quail. She feeds the birds and the Scaled Quail come into her yard not only to eat but to rest in a safe location. The Scaled Quail in the pic above is a male sunning himself. The tiny chicks below were 30 feet away-used a long lens and also cropped to provide very close views. In the pic above the mother quail is lying in the grass while her offspring explore nearby. While I observed from distances no closer than 30 feet away and from inside my car the mother quail was always quite close to the chicks as shown below. I used a long camera lens to get close appearing views. And the male quail was nearby, standing guard as shown in the pic below. The mother quail brought her offspring to a feeding area provided by my friend where they are eating seed fallen from a feeder above. A few days ago as I birded in Florence, CO, a little town near Canon City, I was surprised to find 5 male and at least 1 female Bobolink. Though I have seen Bobolink in this hay field previously it has been a number of years. 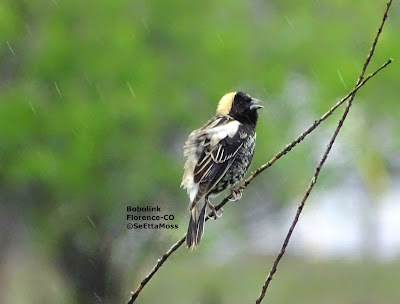 Bobolinks singing from SeEtta Moss on Vimeo.